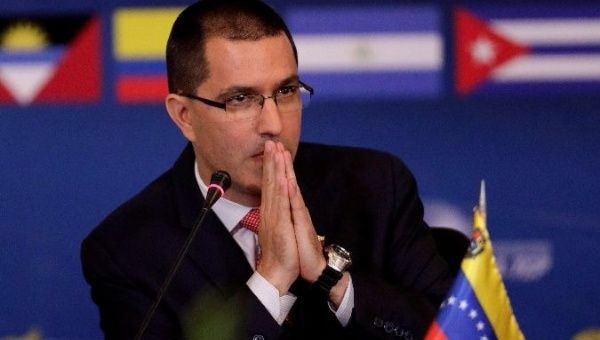 Foreign Minister Jorge Arreaza posted on social media, explaining that the United States government has no moral authority to make such accusations. April 22 (teleSUR) The Government of Venezuela denounced a Country Report on the Human Rights Practice 2017 issued by the U.S. Department of State, which accused the country of human rights violations. The Bolivarian government released the statement on Saturday, saying the allegations against Venezuela are recurring and routine. Foreign Minister Jorge Arreaza posted on social media, explaining that the United States government has no moral authority to make such accusations about any country. The minister added that the United States has historically been documented violating human rights. Venezuela added that the country reaffirms its commitment to the promotion, protection, respect and integral defense of human rights.